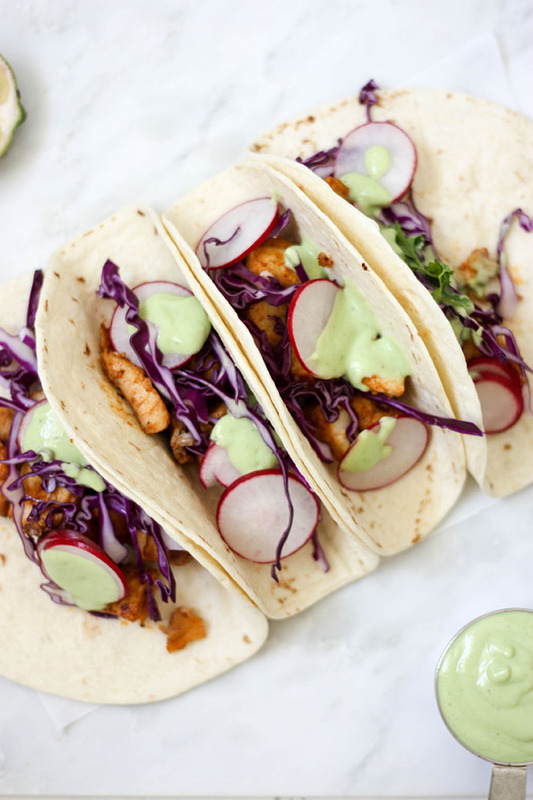 A perfect summer meal, these healthy fish tacos with avocado lime cream are so delicious and easy to make! A smoky, flavoured fish filling, with crunchy vegetables and a creamy avocado lime cream sauce, you can’t go wrong with these! Hello! Happy Almost Cinco de Mayo! If you’re looking for a quick, easy taco recipe that will cater for pescetarian/pork evaders/don’t like beef or chicken taco friends, then this recipe is for you! 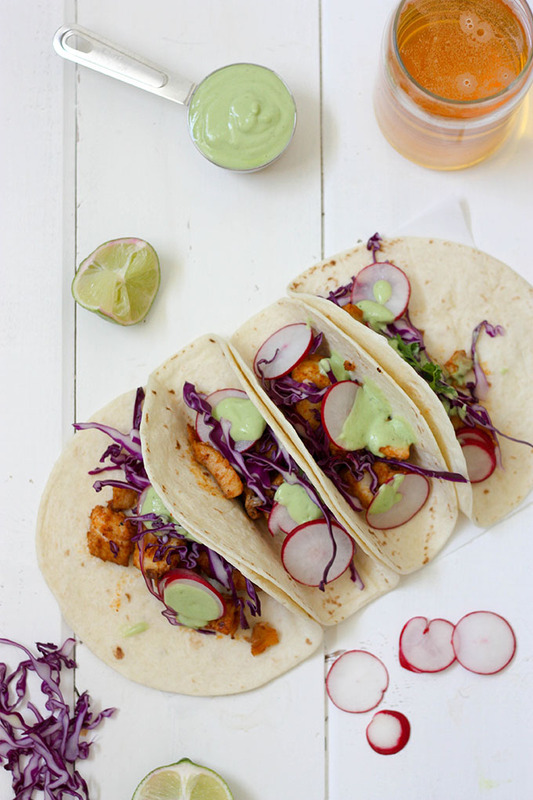 I present…Healthy Fish Tacos made with the easiest homemade taco sauce! These tacos are so damn good, you’ll be wanting to eat them all yourself till you reach what I call ‘taco coma’. Aka when you’re sitting on the couch, pants unzipped, groaning about how you shouldn’t have eaten that last taco, but not secretly upset about it? Don’t lie to me, we’ve all been there! I freaking love tacos, or any Mexican food and I’m having some serious Mexico withdrawals. Almost this time last year we were about to embark on our honeymoon to Mexico and Cuba, and this spring weather has been making me want to jump straight on a plane back to Playa del Carmen! So while I’m dreaming of Mexico I’m taking you to taco town, and while I don’t think these are traditionally Mexican, they are stupidly delicious! I absolutely adore cooking with fish, and actually, prefer a pescetarian diet to eating a whole lot of red meat. So if you’re into fish, then this is the recipe for you! I decided to keep this recipe really simple, and jazzing it up a little bit with homemade taco seasoning, and the super creamy avocado lime dressing. In fact, I think the avocado lime dressing takes the cake in this recipe. The tang of the lime paired with the creamy texture of the avocado and yoghurt make it a beautiful and light cream that is perfect for warmer weather. In fact, with any leftovers, you could always use it on a salad the next day! This salad is texturized with the crunch of the cabbage and radish, and the creaminess of the fish and dressing. They marriage perfectly together and really completes the entire dish! I love that this recipe is so easy to make, and took me about 20 minutes from start to finish. The hardest thing you’ll have to do is to chop the vegetables! Serve with a light IPA or Mexican style beer, or a margarita or two and you’ve got yourself a fancy feast for Cinco de Mayo, or for general weekend entertaining with friends! So that’s a wrap for today! Keep tuned for some new posts this Thursday! 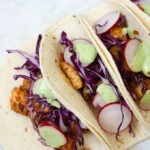 Let me know if you make these healthy fish tacos with avocado lime cream! Tag us on Instagram @thehomecookskitchen for a chance to be featured! 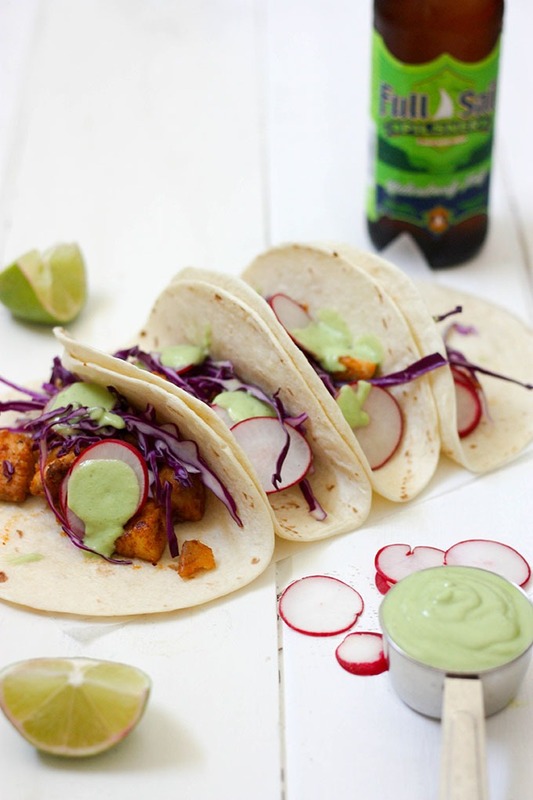 These healthy fish tacos with avocado lime cream are SO delicious, and crazy easy to make! A slightly smokey fish, paired with crunchy vegetables and a creamy, avocado dressing, you can't go wrong! Place the taco seasoning ingredients in a medium bowl. Place fish in bowl with taco seasoning and coat well. Set aside. Combine avocado, lime juice, cilantro, greek yoghurt, water and salt and pepper in a blender. Blend until well combined and smooth. Taste and adjust salt, pepper and lime if required. Heat olive oil in a cast iron skillet (or fry pan) over medium to high heat. Add tilapia, cooking 3-5 minutes or until fish is cooked through and white. 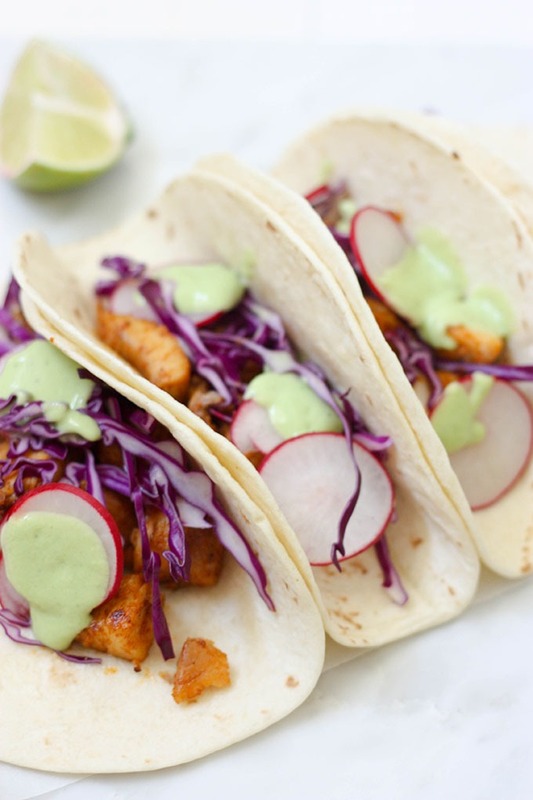 Assemble tacos by placing fish in tortilla, topped with cabbage and radish. Dollop over avocado lime cream and garnish with cilantro. Enjoy with a cold beer or glass of bubbly! Note 1 - I used flour tortillas because that's what I already had in my fridge. These would work fine with corn tortillas as well! I personally prefer flour! On another note, this makes 4 tacos. Double ingredients to feed more people! You had me at tacos. Totally on board with that avocado cream girl!!! ha ha thanks Lindsay! that avo cream is just delicious! You do know how to pick a beer to pair with these awesome tacos:) Love the Cascade Pils! ha ha yessss thank you! the pilsner is one of my favs! These tacos look awesome, Georgie! I hope you feel better soon, my dear :). Have a great rest of your week! Thanks Kelsie!!! And yes, hopefully I get better soon! I NEVER get sick and it’s been twice in about 2 months!!! Thanks Pamela! they are def one recipe that I was super proud of! I love making fish tacos and I think lime crema pairs so well on top of them. Your recipe looks wonderful! thanks Jenni! the lime really makes the dish pop with flavour! Just in time for taco Tuesday! These look delicious! yass my favourite day! thanks Allison! These are so perfect for Taco Tuesday! They look delish! I absolutely agree Dana! i think seafood tacos are completely underrated! Do you know how much I love fish tacos? LOVE them! It’s probably my favorite way to eat fish. Or tacos :). These look fabulous, Georgie! Thanks Kelsie! i am totally in love with fish tacos and tacos as well! especially when I;m eating them on a beach in Mexico with a margarita 😉 oh i wish! I could definitely eat myself into a taco coma with these beauties! I love fish too – although I never really feel like I know what to do with it. Now I do!! And that sauce! Delic!! thanks Katherine!!! the sauce really makes these and I am obsessed with fish! it’s my favourite type of protein! That avocado lime dressing looks extraordinary! thank you Mary! it adds a real creamy texture to the tacos!